Most foreigners who have become native to London are always curious to try the English fish and chips. This is because the notion of deep-fried chips coupled with either mushy peas or curry chips seems an odd culinary combination. However, once sampled, the chances of taking a liking to this classic are hard. The reverse is true for British foodies, who enjoy indulging their taste buds in the food offering of other cultures. Instead of fish and chips, they look trying and sampling raw fish in the form of sushi. Rock Star Sushi bar promises to deliver something special and surprising. Try Something Raw, Why Don’t You? One thing that all seafood lovers can appreciate is the flavoursome bite that is sushi. 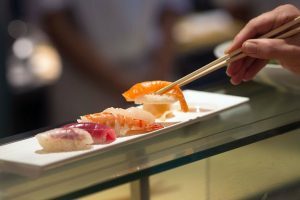 If you are tired of all the regular fish that most mere mortals and peasants eat and are looking to bump your fishy scales a couple notches, then Rock Star Sushi Bar is your hangout spot. This highly rated sushi bar has it all, an assortment of sushi platters that will have your mouth literally watering. The menu promises to serve an amazing taste bud frenzy. You can wrap your tongue around some vegetable rice paper for a taste of the greens, or some Uramaki or some Sashimi. The platters are plentiful, fresh and filling. They are also decently priced so your pockets won’t have any regrets. As with most sushi bars in London, this place is intimate but efficiently designed to cater for large groups. The service is speedy and the staff friendly, knowledgeable and helpful. The reviews on various sites are positive and they have received a 4.9 rating from verified diners on Book table. They are based in South West London, at the Merton Abbey Mills.